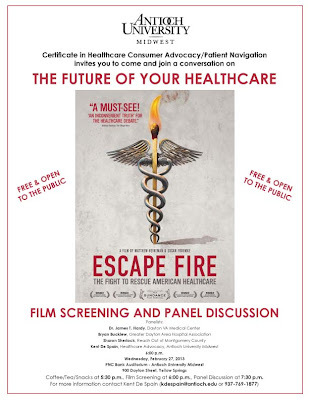 A Yellow Springs Blog: Antioch Midwest to Screen "Escape Fire"
On Wednesday, February 27th at 6:00pm, Antioch University Midwest will be hosting the first Ohio screening of the award-winning new documentary film, Escape Fire: The Fight to Rescue American Healthcare, to be followed by a panel discussion featuring some of the Miami Valley’s most important voices on healthcare. Antioch Midwest is committed to education and conversation about topics that deeply affect the lives of Miami Valley residents, so to help bring the issues raised by the film closer to home, Dr. Kent De Spain, Chair of Midwest’s Healthcare Consumer Advocacy/Patient Navigation program, has invited Bryan Bucklew, Dr. James Hardy, and Dr. Sharon Sherlock to join him in a panel discussion following the film. Formerly the Vice President of Public Policy for the Dayton Area Chamber of Commerce, Bryan Bucklew is now the President and CEO of the Greater Dayton Area Hospital Association. Dr. James T. Hardy is presently the Chief of Staff at the Dayton VA Medical Center. Dr. Sharon Sherlock is an Assistant Professor of Community Health at the Boonshoft School of Medicine at Wright State University and also serves as the Executive Director of Reach Out of Montgomery County, a clinic providing access to health care services for Dayton’s underserved/uninsured population. The event will take place in PNC Bank Auditorium at Antioch University Midwest in Yellow Springs. The screening will begin at 6:00pm with the panel discussion to follow. Coffee and tea will be available in the AUM lobby beginning at 5:30pm. 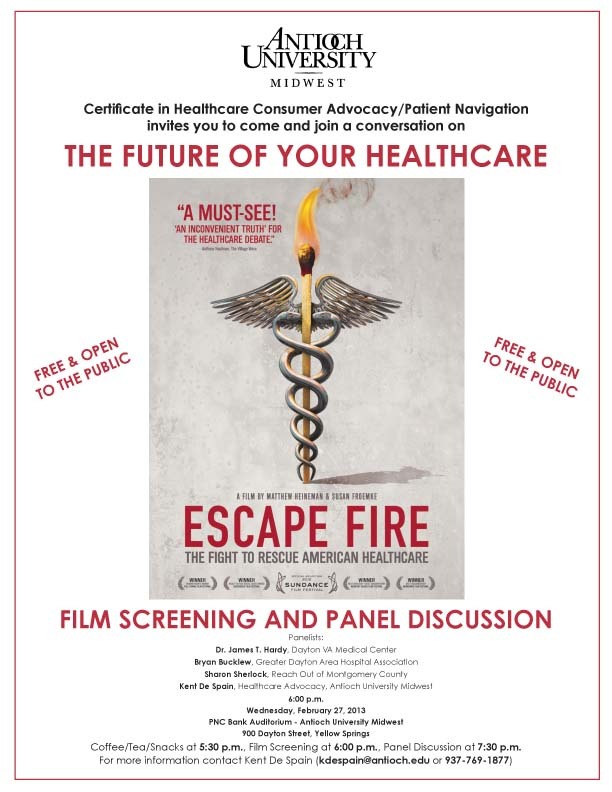 The event is sponsored by Antioch’s Healthcare consumer Advocacy/Patient Navigation program, supported by the generosity of Greene and Soin Hospitals, and is free of charge. Any questions on the film or the event can be directed to Kent De Spain by email (kdespain@antioch.edu) or by phone (937-769-1877).